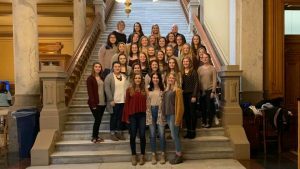 (INDIANAPOLIS) - The State Champion Barr-Reeve Lady Viking Volleyball team received special honors in Indianapolis this week. On Tuesday, the team was honored by a resolution presented to the Indiana General Assembly recognized the champions who secured their 2018 Class 1-A victory after four matches. They had a season of 35 and 4 in 2018.